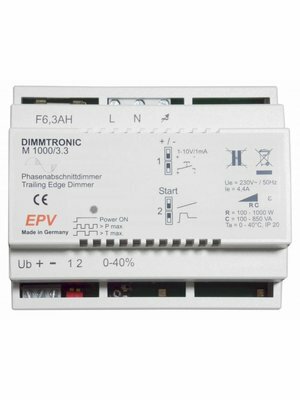 DIN rail dimmers for installation in a sub-distribution. Operable via "push-button mode" or "sensor mode (any 1-10V control)". Made in Germany. DIMMTRONIC: Trusted for its reliability and performance. 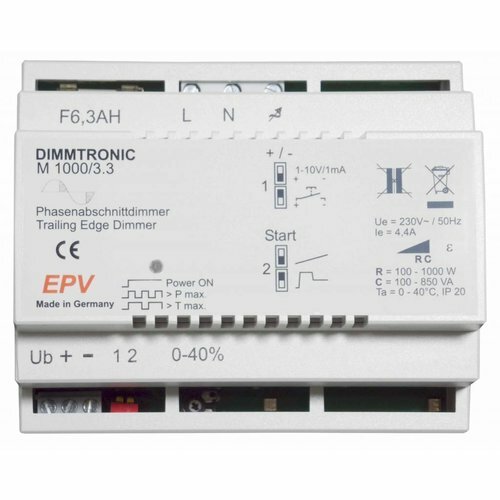 For many years now, EPV DIMMTRONIC trailing edge and leading edge dimmers have earned electricians' trust for outstanding reliability and functionailty that suits many projects. All dimmers are subject to detailed individual testing during manufacturing and even fulfill the strict SELV criteria of a 4kV galvanic separation (most manufacturers only offer 2.5 kV). 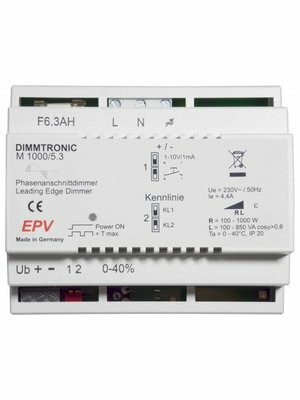 The new DIMMTRONIC generation combines various innovations in order to make these dimmers even more popular in your projects. Which benefits does the new generation deliver? Further improved reliability due to advanced electronics design. A number of electronics design innovations result in a sginficantly power loss / wastage power. That places less thermal stress on the electronic components especially in demanding projects and results in a longer life span. Even in full load conditions the wastage power remains under 9 Watts. Improved connection terminals for a quick and flexible installation. The connector terminals of a dimmer are always an important requirement for a dimmer. The new terminal connectors reliable cover the entire range of wiring from massive mains cables down to fine control wiring: From 2 x 2.5mm2 (or 1 x 4.0 mm2) down to fine 0.5 mm2 cables. This saves you time during installation and guarantees a permanent good connection. Reduced weight lowers your shipping costs. Many dimmers are very heavy and thus expensive to ship. The new DIMMTRONIC dimmers are on average 40% lighter than the previous generation, reducing your shipping costs especially on larger projects.